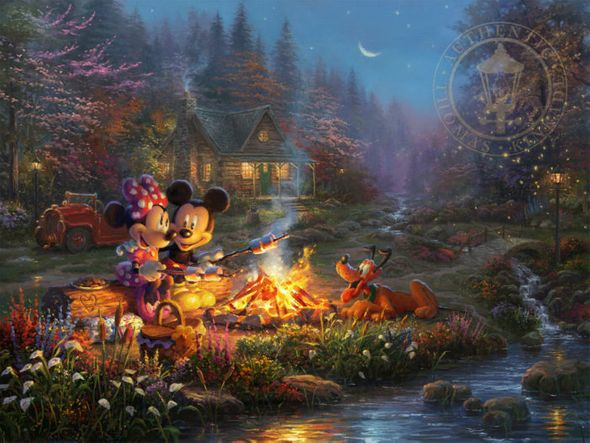 Thomas Kinkade Disney Limited Edition:"Sweetheart Campfire"
About the Art Thomas Kinkade was a life-long admirer of Walt Disney and the wonderful characters he created. While Thom re-created many of his favorite stories on canvas, he also envisioned classic Disney characters set within traditional Kinkade images. In these paintings from Thomas Kinkade Studios, his dream is proudly brought to life. A mountain stream cascades over an array of ancient stones framing a rustic wooden cabin nestled between the trees. A fireplace warms the living room, illuminating the porch, calling to its inhabitants who have spent long day of exploring the vast trails of an ancient forest. Mickey and Minnie are seen relaxing together on an old log, roasting marshmallows over a crackling campfire. To thank Minnie for planning a picture-perfect picnic outing, Mickey has surprised her with s'mores for desert! The prefect treat to the end of a perfect day. The sun has set on this iconic duo and a crescent moon can be seen rising in the night sky. The campfire flames and sparks are almost dancing in the cool breeze as this sixth and final piece closes out the Sweetheart Series. Mickey's faithful companion, Pluto, is still by his side and has sat close by the fire, waiting for a treat, as his face is toasted warm on this chilly night.